Many people complained that they were updating their iPads to the latest version iOS 11.2.1 and the installation crashed. Whenever they are trying to reset their iPads, they get an iTunes error message “The iPad could not be restored. An unknown error occurred (3503)”. In this article, we’ve gathered all possible ways to fix iTunes error 3503 on iPad 4/3/2/1, iPad Pro, iPad Mini 4/3/2/1, iPad Air 2/1 with iOS 11.2/11.1/11/10.3/10.2/10/9/8. When you got iPad/iPhone update error 3503, the first troubleshoot step is to check your USB connection situation. You can unplug the cable and re-plug it to another port to have a try. If that doesn’t help, you’d better use another original Apple data cable for your iPad to try again. Sometimes, network interruption could result in iPad restore error 3503. You need to check your Internet connection and make sure that it is stable while updating or restoring your iPad. A hard Restart can fix many issues by closing all programs running under the background and releasing a lot of caches, which may help you restore your iPad with iTunes smoothly without any errors. Force Restart iPad: press and hold the Sleep/Wake button and Home button for ten seconds simultaneously until you see the Apple logo. Some users on various forums posted that they fixed iPhone restore error 3503 by turning off “Find My iPhone” before updating or restoring with iTunes. So, for iPad users, you can try to turn off “Find My iPad”. Tap Settings >> iCloud >> Find My iPad, turn it off by sliding the toggle switch to the other side and enter your Apple ID password when prompted. Some security software may affect iTunes’ normal operation. 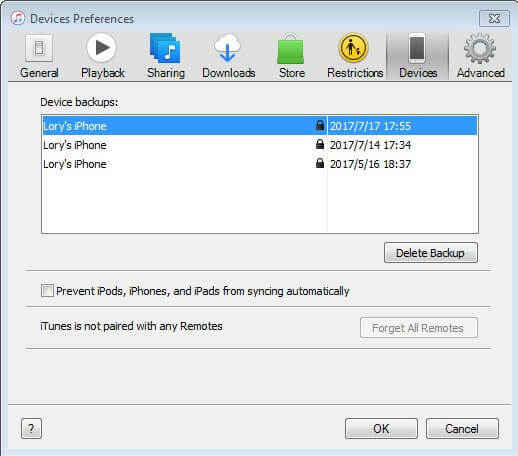 To avoid iTunes restore error 3503, you can close or disable the security software on your PC or Mac first and then use iTunes to restore your iPad. Updating iTunes can fix various iTunes errors. So, if you are using the old version of iTunes, please update it to the latest iTunes version 12.7.2. For Windows users: Open iTunes and then go to Help -> Check for Update to get the newest iTunes. For Mac users: navigate to iTunes -> Check for Updates. If you’ve updated iTunes to the latest version but still get Apple error code 3503, it could be your iTunes library is corrupted. If you worry about losing library data, you can use free software - TunesCare to repair iTunes DB/CDB files to fix iTunes sync issues. Just download and install this magic tool to see how it works. Run TunesCare and click “Fix iTunes Sync Problems” to repair crashed iTunes Library. Wait a few seconds, your iTunes library will be repaired successfully. If your iTunes has a worse issue that can’t be repaired, you can continue using the free TunesCare to click “Fix All iTunes Issues” to get iPad error 3503 fixed completely. If your iPad unfortunately stuck on iTunes logo, Apple logo or black screen during iTunes restore, you can use another iTunes alternative tool called Tenorshare iCareFone to repair the system on your iPad without any data loss. Additionally, you will get rid of iTunes error code 3503 thoroughly. Download this amazing software and follow the steps below. Launch Tenorshare iCareFone and connect iPad to computer, click "Repair Operating System" when detected. Select “Standard Repair” and click “Start” to repair your iPad without losing data. The program will download the latest firmware online automatically. Around ten minutes later, your iPad will be repaired successfully. At the same time, the issue of iTunes error 3503 will also be fixed. This article has introduced 8 effective ways on how to fix iPad error 3503. These ways are also applicable to iPhone X/8/8 Plus/7/SE/6s/6/5s, iPod Touch. Hope it is helpful for you. If you have any further questions, please just feel free to leave your comment below.